This retail suite includes only core applications: Word, Excel, PowerPoint and OneNote. You don't need to purchase a physical license. What you buy is just the product key because that's all You needs! Download Office Home and Student 2016: Sign into Install from Office.com - Setup Office. Enter your product key to get your Office. 100% Working: The Office Home and Student 2016 Key is a lifetime license! Brand new & original. 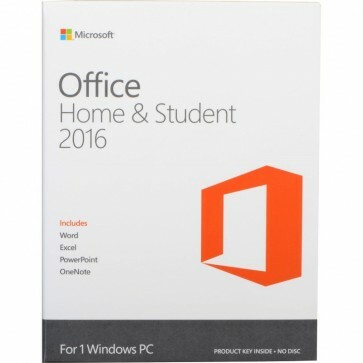 Microsoft Office 2016 Home and Student — What Is New and Different? Accomplish more for home and homework. Best for families who want Office 2016 on one PC. Get more done, from home or school. Compatible with Windows 7 or later. Word 2016: Create and share professional-looking documents with state-of-the-art editing, reviewing, and sharing tools. Excel 2016: Analyze and visualize your data in new and intuitive ways with a fresh user interface plus your favorite keyboard shortcuts. PowerPoint 2016: Create, collaborate, and effectively present your ideas with new slide transitions and an improved Animations task pane. OneNote 2016: It’s your very own digital notebook, so you can keep notes, ideas, web pages, photos, even audio and video all in one place. Your stuff anytime, anywhere: Sign in to Office 2016 and use OneDrive to easily access your recent documents on any device with seamless integration. Required Display & Video Card: 1024 x 768 screen resolution or higher. Graphics hardware acceleration requires a DirectX 10 graphics card.